I was first introduced to this chocolate mousse over a year ago and it’s so good I just have to share it. Because I’ve mentioned it to a few people recently who haven’t heard of it, and it’s become such a staple in our house that I think everyone should try it at least once. I’m not sure where the original recipe came from. I’ve seen it on various sites around the web and to be honest I’m not surprised. There’s no cooking involved, it’s super healthy, vegan, and a perfect after dinner sweet. And no, you can’t taste the avocado! 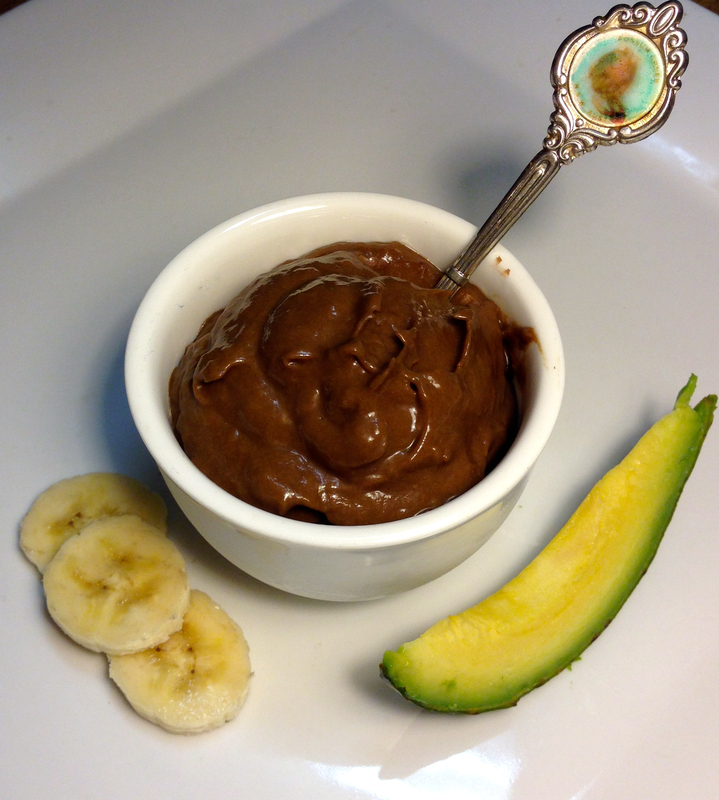 I make mine with a mix of carob and cacao because I love the hint of earthiness that you get when you add carob to the mousse… and if it’s going to be a late dinner I make it with 100% carob – because any caffeine is too much caffeine when you’re one tired Mama and just want to get your kids to bed! The thing I love the most about this chocolate mousse is its simplicity. Throwing four healthy ingredients into a blender and having your kids gobble it up brings a sense of smug satisfaction that any parent can enjoy… which is well worth sharing. Place all ingredient in a blender, food processor or use a hand held blender to process until smooth. Refrigerate for at least an hour before serving. Side note: Use pre frozen banana slices to cut down on the refrigeration time. Yep that’s our favourite sweetener to use with this recipe… delicious! Definitely going to give this a try. What are your thoughts on agave? Could I use that instead honey or maple to sweeten? it’s actually very high in fructose. watching Dr Robert Lustigs “The bitter truth” on youtube, it’s mind blowing! When I do use sweeteners I go for mayple syrup, honey, rapadura or dried fruit. They’re all yummy and have a better fructose to glucose ratio, hope this helps.